Today, we shall be revealing the results of 3rd question of Interview Round: Pageant Series Question. The top 3 spots this time were really neck to neck as they had ALMOST similar answer and hence we had to go into minute details of the answer to come down to a concrete result. You can follow us by subscribing to our Newsletter or keep checking us every Monday to get a new question every time. So all the participants, happy preparation..!!! 1) Do you support the idea of Mercy Killing? Answer: We love our body, it’s the biggest asset of ours. Similarly, we love our family. They’re the most invaluable gift from the treasure of the God. We can never ever think even in our wildest dream to leave these two. However, it’s not same with everyone. There are people suffering from immense pain that forces their soul to leave their beautiful bodies and depart from their caring families. They must be permitted for the same. I stand by the idea of Euthanasia, because I stand by the humanity. Comments by Admin: A well rounded answer where she supports the idea of Mercy killing in utmost positive manner, with a positive start. What we appreciate about the answer is that she made answer look spontaneous by saying ‘We can never ever think even in our wildest dream to leave these two’ which gave an idea that no body would like to die with a choice of their own until and unless the condition is beyond control. Comments by Admin: The only reason Sonia’s answer was preferred over Saloni’s answer was because Sonia’ answer started with positive statement. Although, Saloni’s idea is also positive overall, we suggest never start a statement with negatives like ‘Not’, ‘Never’ etc.However, Saloni’s idea is concrete and the thought of ‘Miracles beyond Science’ is also conveyed so convincingly. 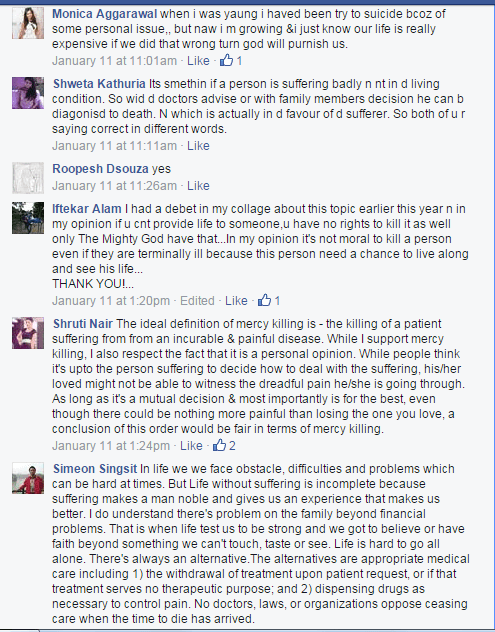 Shruti Nair: The ideal definition of mercy killing is – the killing of a patient suffering from an incurable & painful disease. While I support mercy killing, I also respect the fact that it is a personal opinion. While people think it’s upto the person suffering to decide how to deal with the suffering, his/her loved might not be able to witness the dreadful pain he/she is going through. As long as it’s a mutual decision & most importantly is for the best, even though there could be nothing more painful than losing the one you love, a conclusion of this order would be fair in terms of mercy killing. Harish Sugandh: From my point of view it completely depends. But I am not in support. Allowing everyone for euthanasia will discourage many people who are suffering from deadly disease like cancer and HIV. Only GOD has right to take life, not any human not even the person who is suffering and see the death as only way. It’d be better if they are given a new way of living life. There are Some people in this world who has proved themselves in the worst situation and they are living their life more happily than any normal person. Comments by Admin: Both the answers were perfectly acceptable in spite of being completely contradictory to each other. To tricky question like this, Shruti Nair convinced that Mercy Killing will be a better option to execute by giving an articulate answer which can easily impress judges as You being very well read. On the other hand, Harish channelized the way of Saloni where he believes that there is an existence of Supreme Power called ‘God’ who can make and mar anything and anyone at any moment he wants..!! This answer also reflects his beliefs into the God which is always a Positive point on the stage..!!! Can you think of a better answer? Do let us know.